It’s been roughly a month since the last set was produced, so I’ve updated the scatter graphics, each of which is explained briefly below and at length here. Fulham have improved massively of late and the sheer number of shots they’re taking is pretty impressive: around two more per match than leaders Newcastle. Bristol City are also industrious up front but allow a fair few attempts at their own goal in return. Where the Magpies lead the way is in defence, with nobody permitting their opponents fewer chances, although erstwhile league leaders Huddersfield run them pretty close by this measure. The scale of Rotherham’s task is abundantly clear here, with the Millers wedged into the scary top left corner. 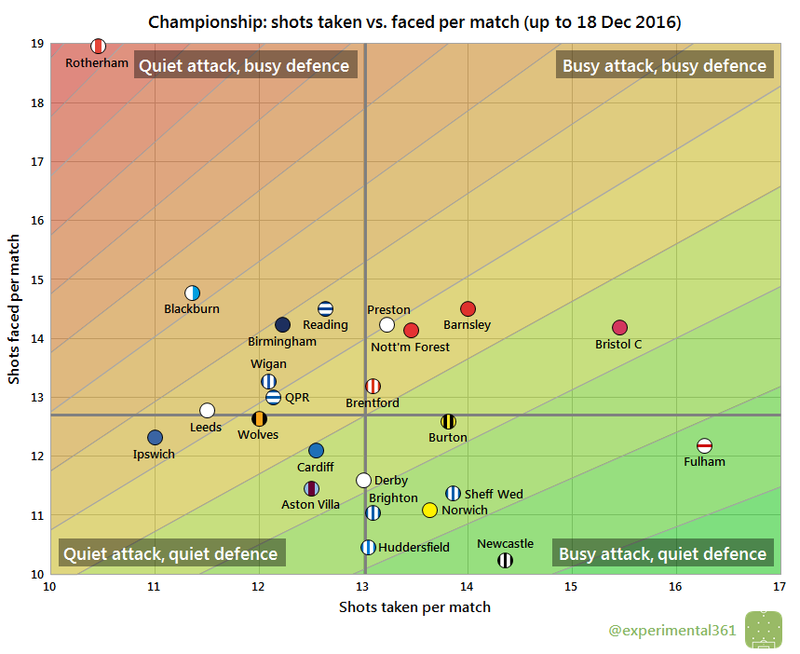 While their attacking output is worryingly low, it’s their defence which is the primary concern: they’ve faced over four more shots per match than anyone else. While Newcastle are the division’s most clinical finishers, a clutch of teams including Norwich and Barnsley have been almost as efficient in front of goal. 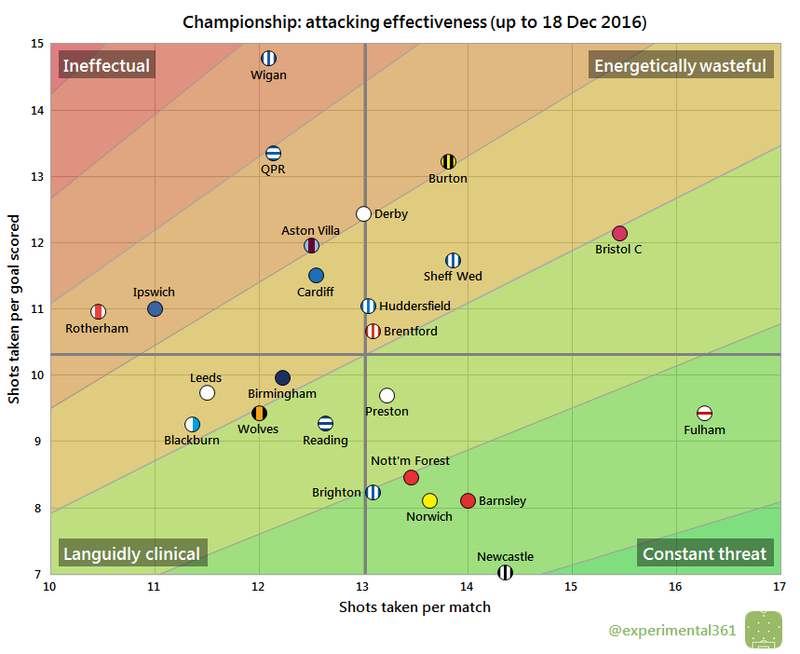 Unfortunately for Bristol City – and to a lesser extent, newly-promoted Burton – their above-average number of chances created have been disproportionately wasted. However Wigan have far more to worry about up front, with only five clubs shooting less frequently and over four more attempts needed to score each goal than the average side. Brighton’s defence has been far more impressive than their attack so far, which is also true of resurgent Derby. 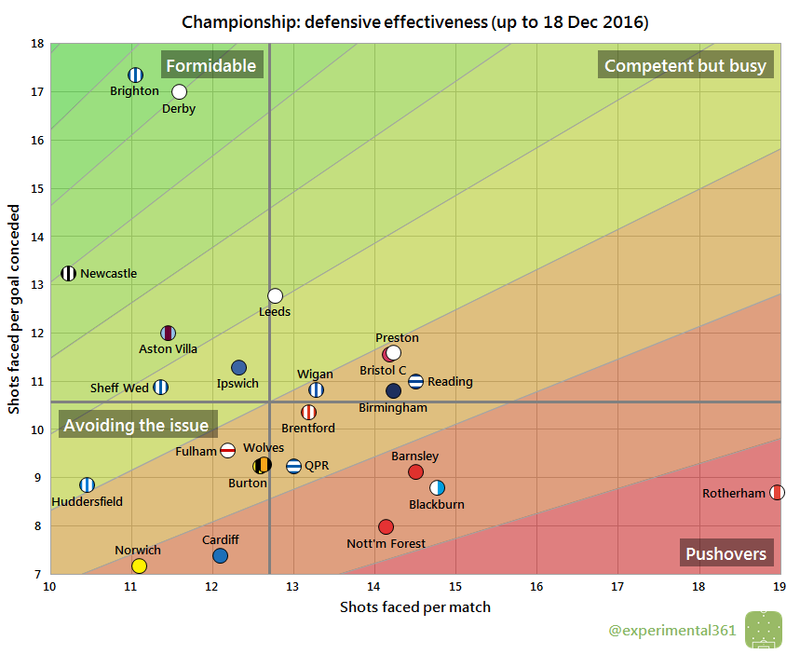 It’s taken over six more attempts to break them down than the average Championship defence and they don’t exactly make it easy for opponents to get shots away in the first place. Norwich and Cardiff have both endured disappointing seasons so far and some porous defending looks to have played a big part. Nobody has faced fewer shots for each goal conceded than these two, despite both permitting fewer opportunities per game than the divisional average. 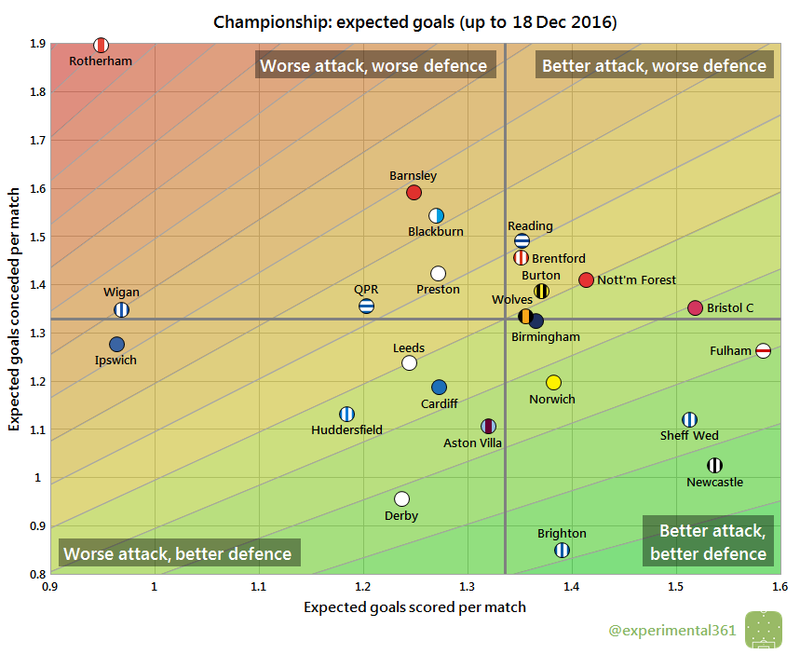 When we adjust for shot quality things unfortunately don’t look much better for Rotherham, although both Wigan and Ipswich have similar attacking shortcomings. Sheffield Wednesday look to be underachieving so far, sitting on the edge of the play-offs despite a similarly healthy balance of chances created and allowed to current league leaders Newcastle. Both Derby and Brighton have looked more impressive at the back than up front, which could lead to some frustration later in the season if a more offensive balance can’t be struck. The same can be said for the likes of Huddersfield and Aston Villa, whose fans will both be hoping for a top six finish.